A great jazz kit built towards that great Gretsch feel. 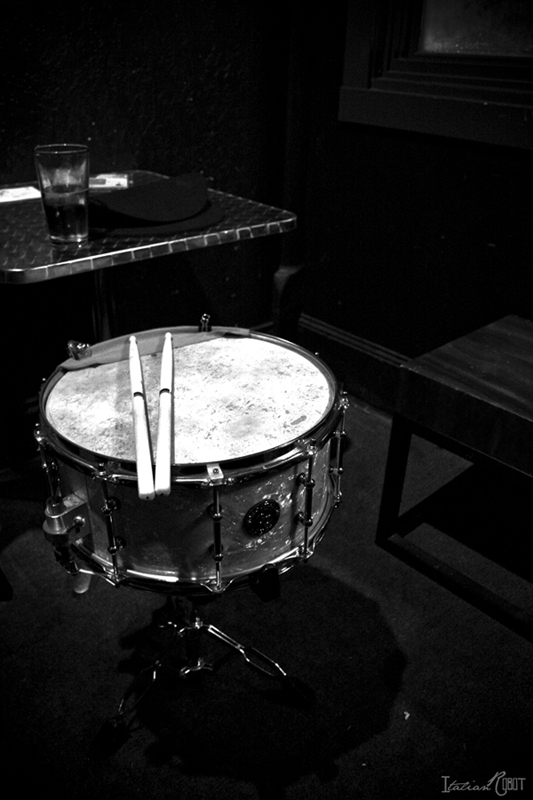 Our thicker vintage style maple shells built with thick poplar inner plies and wide maple reinforcement rings are made to replicate older American style shells to produce a warmer tone and that vintage feel. Sizes include – 8×12″ tom, 14×14″ floor, 14×18″ kick. The added die cast hoops allow for wider tuning range without sacrificing tone and to bring out better highs, and the Gretsch style reproduction lugs all add to the vintage look. 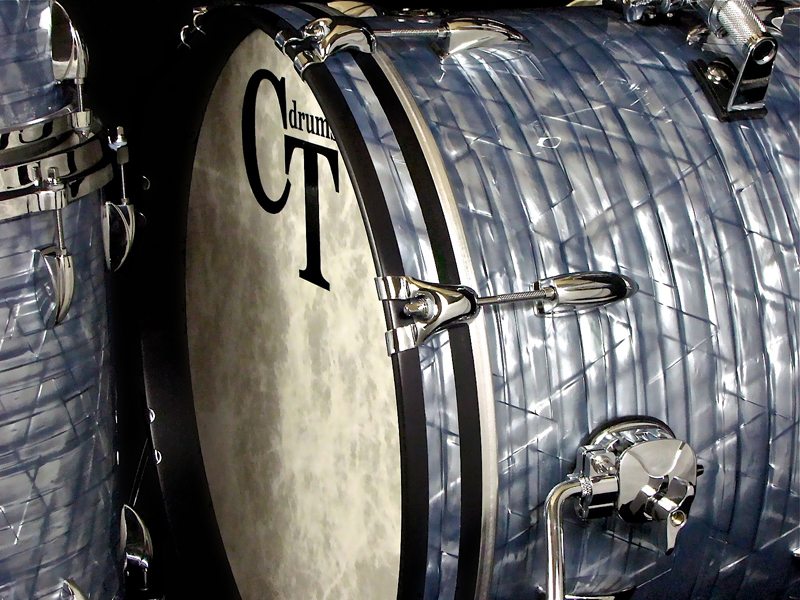 We cut a unique rounded 30 degree bearing edge on all drums to add that fat old school sound that was common on these style kits. 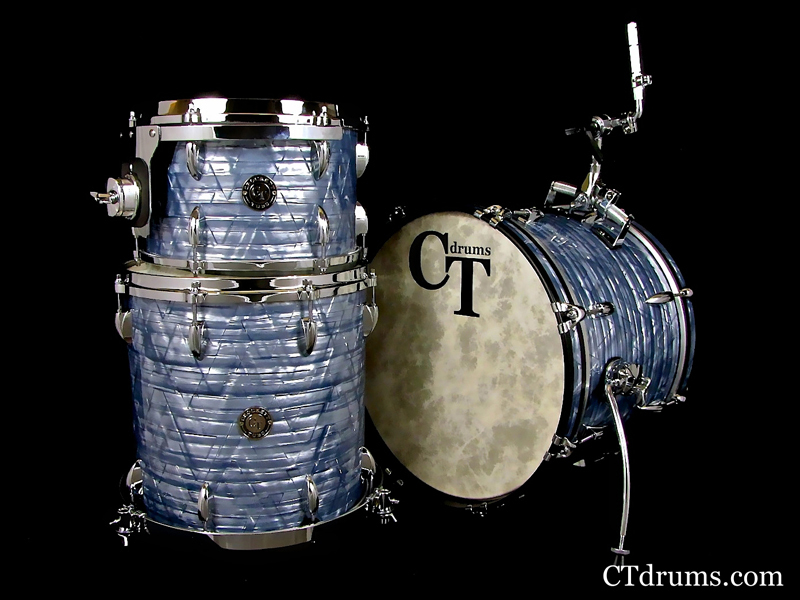 Matched with high quality chromed hardware and the blue sky pearl wrap with all satin black hoops and matching inlays create a great vintage jazz 3pc kit. Other features include a vintage style rail bass drum mount, lightweight vintage folding spurs, modern DSS suspension systems, fiberskyn heads all around, and rounded butterfly claws. Our Vintage Mahogany Series shells are reminiscent of older 70’s American made shells that have become highly desirable for their warm soft tone. Our shells utilize the newer shell forming technology with stricter tolerances while still paying homage to the vintage sound. 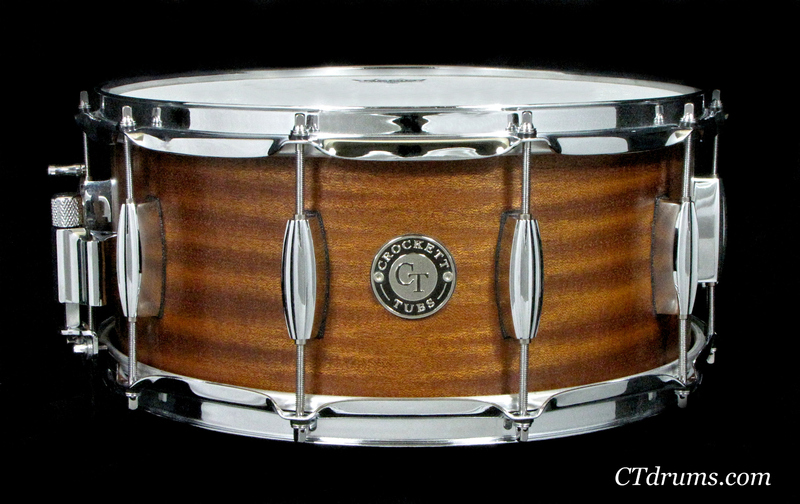 These shells are made of mahogany faces with a poplar core and 10ply wide maple reinforcement rings. Sticking with the vintage sound, we cut a roundover bearing edge to add more head to shell contact for a fatter tone and less ring. Shown here in our natural satin oil with a spectacular ribbon mahogany face, chrome hardware, beavertail double ended lugs, 2.3mm triple flanged hoops, RCK throwoff and German brass snare wires.